Where did that expression come from anyway? Are whistles known for being exceptionally clean? Based on the spit factor, I'd think not. Earlier this week I mentioned how I was planning on implementing a homekeeping system/plan to help keep the dust bunnies and general funk at bay. Guess what? I have actually been working on it (cue fireworks) and am strangely excited about the whole thing. That thing called life? Yeah, apparently I need one. 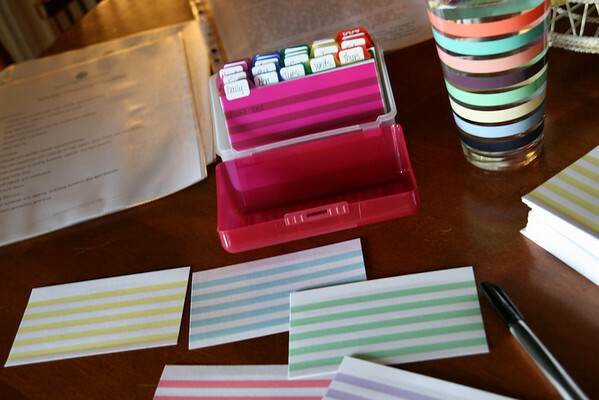 The basic plan is quite simple and you can use cute note cards (the striped ones are not required, but they did make writing my cleaning tasks much more fun). First you list basic tasks you will do every day, one task on each card, which are your daily jobs. Mine are things I'm pretty much doing most days already (make bed, tidy bathroom, wipe kitchen counters/shine sink, tidy living areas, etc.) but I also made cards for things I should do every day (exercise, shower/get dressed, plan dinner) and a few things I'd like to do (daily quiet time, write a card, etc.) as reminders to take the time to do them. These cards are filed behind the daily tab divider. Next, you make weekly cards for cleaning jobs you will do during the week. Each job is written on a separate card, along with the day of the week you plan to complete it and then filed behind the appropriate day of the week divider. Some of my weekly jobs are to clean bathrooms, vacuum, mop, laundry, dust, grocery shop, etc. You also make a section for monthly jobs (larger jobs) and then seasonal (these might be deep cleaning or organizing projects). As I started this project it became obvious that I have been a mood housekeeper, cleaning when I felt like it instead of a method housekeeper, following a plan. It makes sense though that if you are a mood cleaner some jobs may never get tackled because you're never in the mood to do them (and of course they grow larger and yuckier since they are not done regularly). And let me just say, DUH. Here's a view of my work in progress. And I'll just go ahead and put it out there that writing on the striped note cards was highly enjoyable and it was satisfying to file each one behind it's appropriate tab in the cute pink box. Since actually using the box requires sweat and effort, this was probably the highlight of the whole project. As I perused the checklists I thought about the timing of my jobs, wrote out my cards, then re-wrote cards as I changed my mind, I found myself resenting Martha for some of the tasks on her checklists (do people REALLY clean all of that stuff THAT frequently? Are we just pigs? Sure she can list fifteen things to clean in each room each week when she has minions that take care of her house(s) for her). As I was writing my cards I heard my shrill inner voice whining, "But I don't want to clean every single day for hours and hours!! I'm going to be cleaning all the ding-dang time!! WAAH!! "I realized this project is a big philosophy shift for me. Doing something every day (or most days) helps maintain order and cleanliness and prevents jobs from growing too monstrous. While I am planning to officially start following the box method next week (see, it takes a while for a lazy leopard to change her spots) I decided to get a head start yesterday (you know, so I won't bail on the whole thing next week because I think it's too hard). I vacuumed downstairs, mopped, then tackled neglected jobs like vacuuming shutters and windowsills and wiping down cabinets/doors (falling in LOVE with Lavender Fabuloso in the process) while Annelise wiped baseboards and dusted upstairs. It felt good to accomplish all of that even though I was pretty much wiped out afterwards. As I shift from being a mood cleaner to a method cleaner I'm sure (fingers crossed!) that the jobs will be more manageable because they are completed regularly. Are you a mood cleaner or a method cleaner? Have you ever tried Lavender Fabuloso? (You must!) Would you resent Martha's checklists too? At least a little? I have always been a mood cleaner, but this system has helped me reform. I loved that I could set it up the way that works best for my life, so that means no cleaning on Creative Fridays! Some days are heavier than others, but even then it's all doable. The real beauty of it comes after a week or so because everything looks so nice that the next time around for the cleaning is manageable. I don't know why I used to leave dusting or cleaning the top of the dresser in the kitchen until they were an ordeal to do. Now doing those jobs once a week makes them easy breezy. Definitely a mood cleaner, unfortunately. I do what must be done to keep our sanity and that is it. Shameful. I haven't been in the mood for over a month... You know what's especially fun about summer in Utah? I don't have to clean. I mean, I do, but not that organizing stuff. I love the freedom. I LOVE your index cards and want to start saying "ding-dang." You are so funny, Holly, and so fun to read. I appreciate your honesty as well and hope you'll continue to share your struggles along with your (many) triumphs. I think I ruined my kids on cleaning when they were little, part of "punishment" became cleaning baseboards! I asked my daughter to do it the other day and she said "I'm not in trouble!" so we still have dusty baseboards!